As is evident in this declaration, the terms “Jewish” and “Zionist” were used synonymously by the Arabs. Thus, even before the establishment of Israel, the Arab states had declared an economic boycott against the Jews of Palestine. The boycott, as it evolved after 1948, is divided into three components. The primary boycott prohibits direct trade between Israel and the Arab nations. The secondary boycott is directed at companies that do business with Israel. The tertiary boycott involves the blacklisting of firms that trade with other companies that do business with Israel. The objective of the boycott has been to isolate Israel from its neighbors and the international community, as well as to deny it trade that might be used to augment its military and economic strength. Israel's capacity to reach its full economic potential was hindered for decades by the actions of Great Britain, Japan and other countries that cooperated with the boycott. It has undoubtedly enhanced Israel’s isolation and separated the Jewish State from its most natural markets, but the boycott failed to undermine Israel’s economy to the degree intended. 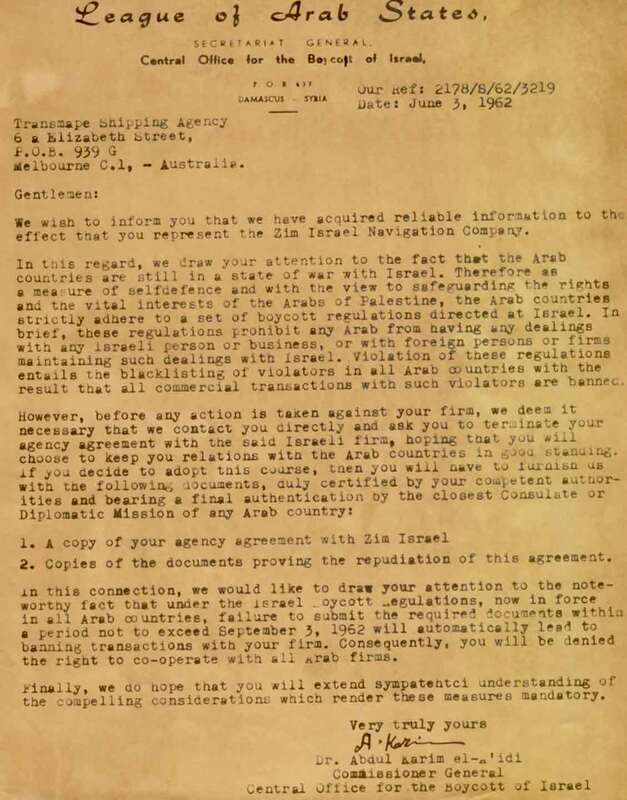 For many years, language has been included in the foreign operations appropriations acts concerning the boycott. For example, Section 535 of the Foreign Operations, Export Financing, and Related Programs Appropriations Act, 2006 (P.L. 109-102), states that: (1) it is the sense of Congress that the Arab League boycott is an impediment to peace in the region and to United States investment and trade in the region; (2) the boycott should be revoked and the CBO disbanded; (3) all Arab League states should normalize relations with Israel; and (4) the President and the Secretary of State should continue vigorously to oppose the boycott and encourage Arab states to assume normal trading relations with Israel. U.S. embassies and government officials raise the boycott with host country officials, noting the persistence of illegal boycott requests and the impact on both U.S. firms and on the countries’ ability to expand trade and investment. In August 2007, the federal antiboycott statutes were revised amending the existing penalty guidelines and outlining procedures for firms to voluntarily report violations of the law. Officials hope that by providing companies an incentive to “come clean ” they will do so and save the Commerce Department the need for costly investigations. Since the signing of peace agreements between Israel and the PLO and Jordan, the boycott has gradually crumbled. The Arab League was forced to cancel several boycott meetings called by the Syrian hosts because of opposition from countries like Kuwait, Morocco and Tunisia. The primary boycott — prohibiting direct relations between Arab countries and Israel — has slowly cracked as nations like Qatar, Oman and Morocco have negotiated deals with Israel. Furthermore, few countries outside the Middle East continue to comply with the boycott. Japan, for example, has exponentially increased its trade with Israel since the peace process began. Still, the boycott remains technically in force and several countries continue its enforcement (e.g., Lebanon enforces the primary, secondary and tertiary boycotts). In April 2004, representatives from 19 Arab countries met for the 72nd conference Bureau for Boycotting Israel to discuss tightening the boycott. The four-day meeting considered blacklisting new companies that do business with the Jewish state. Mauritania, Egypt and Jordan, which have diplomatic ties with Israel, stayed away from the meeting. In late 2005, Saudi Arabia was required to cease its boycott of Israel as a condition of joining the World Trade Organization. After initially saying that it would do so, the government subsequently announced it would maintain its first-degree boycott of Israeli products. The government said it agreed to lift the second and third degree boycott in accordance with an earlier Gulf Cooperation Council decision rather than the demands of the WTO. In June 2006, the Saudi ambassador admitted his country still enforced the boycott in violation of promises made earlier to the Bush Administration and the Saudis participated in the 2007 boycott conference. During free trade agreement negotiations with Bahrain, Oman and the United Arab Emirates, the status of the boycott was an issue of concern and the countries agreed not to comply with the boycott. However, indications suggest that these countries continue to support the boycott. Representatives from only 14 Arab countries attended the biannual conference of the Arab League’s Bureau for Boycotting Israel in Syria in April 2007. Mauritania, Egypt, Jordan, Bahrain and Oman were among the nations that were absent. Those that did participate included the Palestinian Authority, Lebanon, Saudi Arabia and Iraq. The U.S. government has raised concerns about the enforcement of the boycott by Iraq. In 2006, the number of requests from Iraq for U.S. companies to comply with the boycott increased 287%. Requests in 2006 were also up from Lebanon, Bahrain and Qatar. The largest source of boycott-related requests comes from the United Arab Emirates. In 2006, according to the Department of Commerce, nine companies paid just under $96,000 to settle allegations that they violated the U.S. antiboycott provisions, an increase from five cases in 2005 and $57,000. In January 2007, the New York office of the National Bank of Egypt was fined $22,500 for boycott violations. Today, most Arab countries publicly support the boycott even as several quietly trade with Israel. One reason has been U.S. pressure for these countries to normalize relations. Beyond the Arab League boycott, an additional boycott campaign was launched in 2001 aimed at isolating Israel and, ultimately, making it disappear with the help of international sanctions. This boycott, divestment and sanctions (BDS) movement has spread around the world. Various countries, including Spain, France and the United Kingdom, have taken measures to outlaw aspects of the campaign. Legislation at the Federal level is still being developed to combat BDS. Congress, for example, has called on negotiators in trade talks with the European Union discourage politically motivated economic actions intended to penalize or otherwise limit commercial relations specifically with Israel or person doing business in Israel or in Israeli controlled territories. The BDS movement has been adopted by anti-Israel organizations on a number of college campuses, some of which have attempted to convince their universities to divest from U.S. companies doing business in Israel. Even on the few campuses where student government passed divestment resolutions, the university administrations have made clear they have no intention of boycotting Israel. Another campus-led phenomenon involved faculty who have lobbied professional associations to boycott Israel. Curiously, these faculty insist on their academic freedom to call for a boycott against Israel, but deny their critics the right to speak out against them. They also see no hypocrisy in denying Israelis their academic freedom. The Modern Language Association and American Studies Association were two of the groups that voted to boycott Israel. The decisions had no practical effect since the associations themselves do not have relations with Israel and the only members who adhere to the boycott are those who had no interest in visiting Israel or working with Israeli colleagues. Those decisions to boycott Israel also provoked a backlash against faculty and associations supporting BDS. The American Studies Association decision, for example, was condemned by more than 200 university presidents/chancellors. More esteemed associations, such as the American Historical Association, have rejected efforts to put a boycott on their agenda. The backlash has extended off campus as well where state legislatures have adopted legislation aimed at preventing any boycott of Israel. Mitchell Bard is the Executive Director of the American-Israeli Cooperative Enterprise and the author/editor of 24 books including The Arab Lobby: The Invisible Alliance That Undermines America's Interests in the Middle East , Death to the Infidels: Radical Islam's War Against the Jews and the novel After Anatevka: Tevye in Palestine. Source: Martin A. Weiss, Arab League Boycott of Israel, Congressional Research Service, (June 10, 2015).